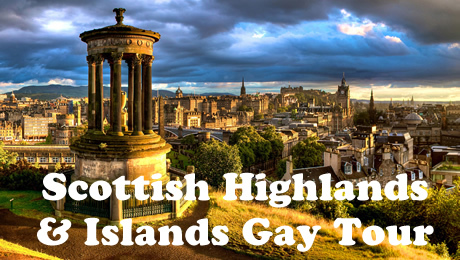 Glasgow, Stirling, Loch Lomond, Argyll, Glenfinnan, Isle of Skye, Perthshire, Pitlochry, Edinburgh, and more! It’s not just all about kilts and bagpipes! From the utterly charming UNESCO World Heritage-designated city of Edinburgh to the stunningly dramatic land and seascapes of the Isle of Skye; from castles both intact and in moody ruins to Scotch Whisky distilleries ... Scotland packs a punch with its steep and fascinating history, strong cultural traditions, gorgeous scenery, a very tasty culinary scene, and lovely first-rate accommodations along the way. Then we head for the hills, first by way of the “bonnie, bonnie banks o’ Loch Lomond.” It is this gorgeous lake that features in a very moving song you no doubt will recognize ... “ye’ll tak’ the high road, and I’ll tak’ the low road.” The West Highlands then beckon with its grand scenery of high, rocky mountains rising out of wild glens. Here we stop for an overnight and dinner at a charming country house in the wilds of Glen Coe. The following is our planned itinerary, which is being published about a year in advance of operating this tour. It is possible that there will be changes to some of the specific sights visited during this program. We’ll come together at our deluxe hotel in the center of Glasgow in the early evening for a welcome drink and to meet fellow travelers before heading out for our welcome dinner in this buzzing and friendly city. Note: We can arrange an extra night for you at our group hotel in Glasgow before our tour begins and/or at the end of the tour depending on your travel plans. We’ll only be able to scratch the surface of the city on the tour program, so if you’d like more time to explore Glasgow please let us know. See “Arrival & Departure Logistics” for further information regarding arrival into Glasgow. Scotland’s largest city at one time didn’t have the best reputation – but that has changed. This re-energized vivacious city on the River Clyde hit some tough times in the 20th century, but it has bounced back and easily vies with Edinburgh now. The locals are known for their chattiness and friendliness, and there’s a good bit to see here, of course. It’s something of a pilgrimage site for art, design, and architecture buffs – with a cityscape that is packed with Victorian facades, early 20th-century touches, and bold new construction. On our itinerary we’ll go to the remarkable Kelvingrove Art Gallery and Museum, dubbed the “Scottish Smithsonian,” with its impressive collections displayed in a grand, century-old Spanish Baroque-style building. A bewildering variety of exhibits are presented in various themed rooms, from fine art to stuffed animals to a WWII-era Spitfire fighter plane. Also on our itinerary is the imposing Glasgow Cathedral – the only Scottish church that survived the turmoil of the Reformation mobs mostly intact. This Gothic-era construction has a wooden barrel-vaulted ceiling, and the church is decorated with seven pairs of figures representing the seven deadly sins. In the lower church is a forest of pillars that surround the tomb of St. Mungo, who founded a monastic community here in the 5th century. Later in the day you’ll have some free time to explore according to your own interests. Leaving Glasgow behind we venture northward to the impressive Stirling Castle. Perched on a volcanic crag at the top of its eponymous town this historic royal fortress and palace is among Britain’s most fascinating. 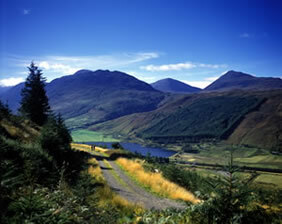 Scotland’s two most important battles for independence were fought within sight of this hilltop stronghold. Views abound from here. These vistas, combined with its physical situation, architecture, and very important historical significance, make Stirling Castle a grand sight. Among its most extraordinary components is the mid-16th century Royal Palace, where the Stuart monarchs resided and where Mary, Queen of Scots was crowned. Stirling’s beautifully preserved Old Town, where our lunch spot is located, is certainly worth exploring, too, with its wealth of noble buildings and cobbled streets. The Lowland belt gives way to Highlands splendor as we continue northward from here where a multitude of lochs (narrow lakes or sea inlets) pepper the beautiful landscape reflecting the peaks and clouds above them. Evocative scenery takes hold as we wind our way around the “bonnie banks” of pretty Loch Lomond with 3,000-foot mountains flanking its sides, meandering on country roads through some grand mountain scenery, and eventually reaching our overnight spot in the mountains of Argyll where beautiful surroundings and a delicious dinner await us. Today we continue up through the Highlands, passing through more beautiful mountain scenery: rolling forested hills, spectacular mountains, more lochs, and past Ben Nevis (Britain’s highest peak at 4,400 feet). Eventually we join the Road to the Isles. This 46-mile scenic route, passing birch and bracken-covered mountains and glassy lochs, will take us to Glenfinnan, where a monument to Bonnie Prince Charlie is erected, at one end of Loch Shiel – a beautiful setting. It was from here in 1745 that he began his (ill-fated) rebellion against the English. 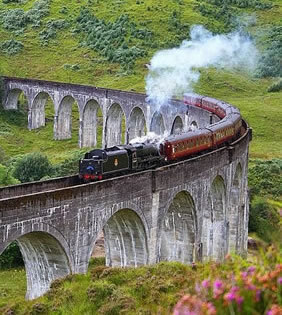 Depending on the weather and timing we may enjoy a pleasant walk of ¾ mile each way for a great view of Loch Shiel and the Glenfinnan Viaduct – the famous 21-arch rail bridge built in 1901 and featured in one of the Harry Potter films. The end of the Road to the Isles is the little town of Mallaig where we have some lunch, and then from here it’s a 30-minute ferry ride over to the wonderful Isle of Skye. We make our way up to Portree, one of the most attractive port towns in northwest Scotland with a cliffedged harbor, fishing boats, and multicolored houses. It’s here that we settle into our lovely hotel perched above the town and have a delicious dinner awaiting us this evening. 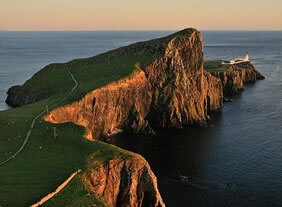 The rugged beauty of the Isle of Skye has been proclaimed since the early 1800s when Sir Walter Scott visited. Mountains, sea, cliffs, lochs, glens, farming villages, castles, fine dining, arts and crafts – they’re all here on this remarkable island, which is also an important center of Gaelic culture and language. Skye has some extraordinary geological scenery to be seen on the Trotternish Peninsula, and then we head westward to the Glendale region where we may spot otters, seals, and dolphins off its rocky coast and eagles above. In a commanding position Dunvegan Castle has been the seat of the chiefs of Clan MacLeod for over 700 years. A curious note here is the scrappy remnant of the Fairy Flag, said to have been a gift from a fairy to the clan and thought to have miraculous powers when unfurled in battle. The castle’s gardens are very pretty. After a full day out in Skye we return to our base in Portree where you have an open dinner this evening. You may wish to walk into town or enjoy another meal at our hotel’s excellent restaurant. 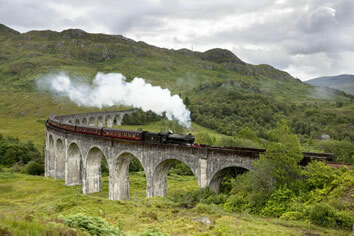 The next stage of our itinerary has us returning to mainland Scotland. Shortly after crossing the Skye Bridge we’ll stop at one of the most iconic images of Scotland. 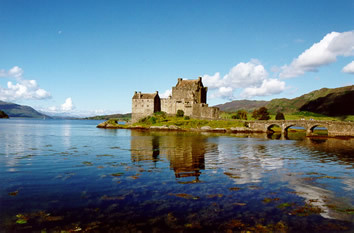 Eilean Donan Castle perches on an islet set against a backdrop of mountains and guards the confluence of three lochs – Alsh, Long, and Duich. The unique beauty of the place has led it to appear in movies and television and is perhaps the most photographed sight in Scotland after Edinburgh’s castle. 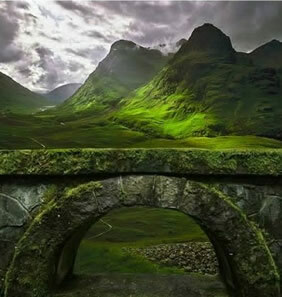 It connects to the mainland via a stone-arched bridge. Dating from the 14th century this romantic sight has what you’d expect in an ancient castle: massive stone walls, timber ceilings, and winding stairs. After visiting the castle lunch is on your own at the very good self-service restaurant next to the gift shop. Onward we travel now to Perthshire, the epitome of a well-groomed rural Scottish county and the long-established domain of Scotland’s well-to-do country set. But first, why not a stop at a Scotch whisky distillery where we can have an interesting tour and learn about the process of producing a single-malt whisky — and follow this up with a tasting, of course. Our historic and atmospheric hotel for tonight is in the charming town of Pitlochry on the Tummel River. Dinner is included at the hotel this evening. Leaving Perthshire this morning we make our way down to Edinburgh. Before entering the city though, we skirt around to lovely Rosslyn Chapel, a place that’s been cloaked in legend for centuries. The riotously ornate chapel is revered for its sublime 15th-century stone carvings – some of the finest in the world – and its past is steeped in intrigue and great mystery, probably accounting for its connection to myths and legends and its appearance in The Da Vinci Code. Covering almost every square inch of stonework are human figures, animals, and plants. 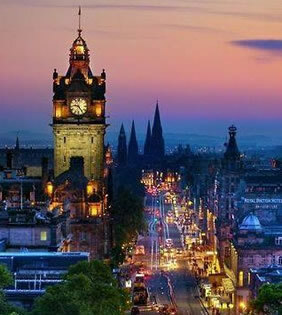 After lunch it’s into Edinburgh we go — Scotland’s captivating and very handsome capital city. We’ll have an introduction to this fine city by driving through New Town — “new” in this case means 1700s! — with its abundance of beautiful Georgian architecture and squares as well as the Princes Street Gardens. We’ll also do a drive-by of the Royal Yacht Britannia, the British Royal Family’s home on the seas for over 40 years, before arriving at our gorgeous hotel. Dinner is open this evening, and there’s no shortage of good restaurants surrounding the hotel. Continuing our exploration of Edinburgh this morning we’ll take in the lovely view of the city from the volcanic crag known as Calton Hill. We’ll also see the ultramodern Scottish Parliament building before proceeding up the Royal Mile and eventually coming to what many consider to be Scotland’s most impressive castle — Edinburgh Castle. The tour of this remarkable sight will be our last group activity after which you’re free to spend the afternoon according to your own interests: last-minute shopping; good museums; the Palace of Holyroodhouse; or perhaps back to the Royal Yacht Britannia if you’d like to take a tour onboard. This evening we’ll come together for our farewell dinner and recount the many extraordinary sights we got to enjoy along the way. Today you’re homeward bound — or perhaps you’ll be continuing your travels to further exciting destinations. A taxi to the Edinburgh airport or train station is easily arranged. Please Note: We can arrange extra hotel nights for you in Edinburgh after the tour if you’d like to extend your stay in this wonderful city. 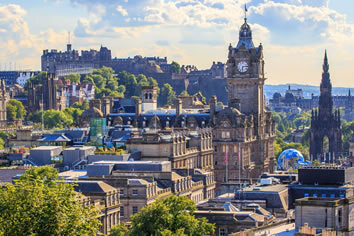 • Edinburgh – The charming, culturally rich, historically rich capital — one of Europe’s handsomest and a UNESCO World Heritage Site — with iconic sights such as its striking medieval castle, the Royal Mile, Old Town, and Georgian architecture. 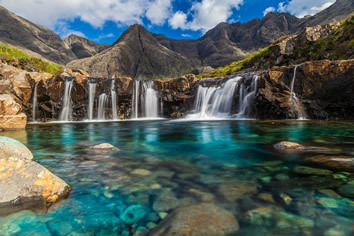 • Isle of Skye – An island of sheer beauty with the misty Cuillin Mountains, rocky shores, hidden beaches, and shady glens, plus a historical link to Bonnie Prince Charlie as well as a modern arts and crafts scene. • Stirling Castle – Historically strategic, holding fort over the passage between the Lowlands and the Highlands, home of the Stuart kings with spectacular views over a gentle countryside. • Scotch Whisky Distillery – An informative, fun tour in a lovely setting to refine an appreciation of Scotland’s national drink, and enjoying a wee dram, of course. • Glasgow — One of Britain’s most intriguing cities, sophisticated yet earthy, with handsome Victorian buildings, great shopping, warm people, and a lively pub and music scene. • Road to the Isles — Encompassing some of the most iconic images of Scotland and considered one of the loveliest drives in Scotland with mountain views, shimmering lochs, historical places, and steeped in Jacobite history. • Rosslyn Chapel – An exquisite and ornate 15th-century cathedral-like masterpiece that is a testament to the skills of its medieval sculptors. • Gorgeous Landscapes – Crystal-clear lochs and rivers, wooded hills, craggy mountains, wide-open moors. 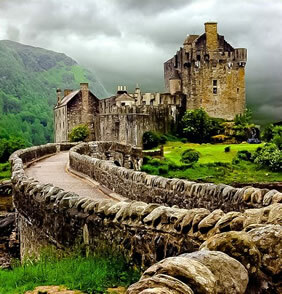 • Eilean Donan Castle – Postcard-perfect, standing on an islet set among three lochs and arguably the most photogenic of Scotland’s myriad castles. • Delicious meals and lovely accommodations, of course! • Passports and other expenses of a personal nature such as minibar charges, laundry, telephone calls, etc. During our tour we’ll be using excellent, comfortable upscale properties that are recipients of numerous accolades and awash with plenty of character. Please note, however, that we reserve the right to make changes to our selection of hotels described here. Winner of the most stylish hotel award at the Scottish Style Awards this luxury accommodation in Glasgow, opened in 2016, has 83 rooms with full-length New York-style loft windows evoking a Manhattan vibe, soft leather seating, and writing desks. Artistic flourishes include framed musical scores and poetry on the walls. The owner’s wife is a renowned interior designer who has created a modern-classic fusion of exposed brickwork with high quality furnishings and fittings. Lounges are discreetly lit, and corridors are adorned with books and artwork. Many restaurants are within walking distance, and the hotel’s own restaurant is highly recommended. A relaxed country retreat on the River Orchy and surrounded by beautiful mountain scenery with 22 wellappointed rooms, an impressive selection of craft beers and malt whiskies, and delicious dining – this is our overnight stop on our way up to Skye. Located at the gateway to Glencoe amidst the stunning scenery of the Scottish Highlands it’s a relaxing, rural escape — nothing fussy, just nicely done and very comfortable. 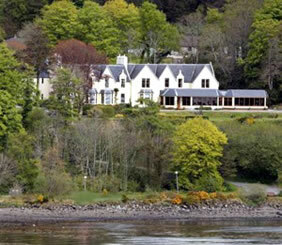 It received recognition in the Country House Hotel category of the Scottish Hotel of the Year Awards. Our selected hotel used to be a Victorian-period hunting lodge. From the property, set within 15 acres of mature private grounds, are views of the Cuillin Mountains, Portree’s harbor, and the sea. With excellent dining and a friendly staff, the hotel has received many accolades over the years. Its lounge boasts some 130 malt whiskies. The 27 luxurious rooms have reproduction antique furniture. It’s also just a 10-minute walk down to the center of Portree. Our castle-like hotel in Pitlochry has been welcoming guests for 140 years. It’s full of Victorian pomp and character in a lovely scenic setting perched on a hillside with wonderful views overlooking the Tummel Valley or the mountains. Treatments are available in their spa, with the indoor pool being fed by mountain spring water, and the vast grounds encompass beautiful and extensive gardens, lovely woodland walks, and a waterfall. The 106 guest rooms could stand a decor refresh, but for a 1-night stopover we think it’s fine. Overlooking one of Edinburgh’s prettiest private garden squares, our selected hotel consists of seven inter-connecting Georgianera townhouses in the heart of the New Town, a UNESCO World Heritage-declared section of the city. The hotel has very recently undergone a multi-millionpound restoration and refurbishment: all of the guest rooms have been given a smart, new look, inspired by the golden age of travel and a genuine sense of Scottish hospitality. The lovely internal courtyard is an oasis of calm with a glass roof where food is served throughout the day. There’s a new gym and spa with a full range of spa treatments available alongside a pool, sauna, steam room and gym. At the time of publishing this program Glasgow’s airport is served by a few nonstop flights from North America (from JFK, Newark, Philadelphia, and Toronto). This may change in the coming months should new routes be introduced. Otherwise, it’s easy to connect via many other cities (e.g., London Heathrow, London City, London Gatwick, Manchester, Dublin, Paris, Frankfurt, Munich, Amsterdam, Reykjavik, and possibly others). Alternatively, you can fly into Edinburgh and take a train to Glasgow, which only takes about 90 minutes. It’s straightforward to take a taxi from the Glasgow airport or train station to the group hotel. Our tour ends in Edinburgh, and there are flights going from there to all the same cities mentioned above – plus others. While this is by no means an adventure-travel type of vacation you should be comfortable walking up to a couple of miles each day (though not all at once), and you ought to have good walking shoes. Please check with us if you have any concerns in this area. We have structured the days in this program in the most logically flowing way in order to keep driving times to a minimum. However, some days will see more driving than others. There’s a lot to see in Scotland (and even with the distances we cover we’re only scratching the surface). None of the driving is done at very long, uninterrupted intervals. We stop throughout the day for our visits, thus breaking up the day’s activities. Our transportation will be in a comfortable small tour bus, and at no time will it feel like an endless road trip. We do cover a good bit of ground on our transfer days (Days 3, 4, 6, and 7) – about 100 to 150 miles on those days. The weather is another factor to consider. This is northern Europe, and even in June there’s a chance it could be cool and there’s a chance it could be rainy. It’s the luck of the draw. On our previous Scotland tours we were blessed with mostly fine weather all along the way and got some rain only during one of the longer drives. We hope for the best but are realistic. Glasgow and Edinburgh have an average high temperature of 63 F in June and about 2.75 inches of rain for the month. 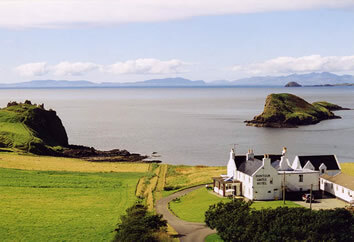 On the Isle of Skye the average high temperature is 61 F with rainfall about 3.3 inches over the month. While as accurate as possible at the time of printing, this itinerary should be considered an approximate indication of the schedule and scope of activities, trip routing, and meals, rather than an inflexible schedule of events. It is subject to change due to circumstances beyond our control. We reserve the right to maintain flexibility in order to take advantage of unforeseen opportunities. This trip is subject to the Limitation of Liability and all the Terms and Conditions as detailed in the Trip Enrollment Form. To realize the maximum enjoyment from your Venture Out trip, we encourage participants to have flexibility, a sense of humor, curiosity and enthusiasm about new people and places, and an openness to the unexpected. With a spirit of adventure and positive attitude, we’re sure you will have a very special travel experience. If you are uncertain about the level of comfort, difficulty, or any of the activities described in this itinerary, please email us to discuss your concerns. A small group surcharge of $100 per person will be added to a group size less than 14 travelers. A small group surcharge of $200 per person will be added to a group size less than 12 travelers. Initial deposit of $400 per person at time of reservation; second deposit equal to 20% of the base tour cost per person due 120 days prior to trip; final balance due 60 days prior to departure.